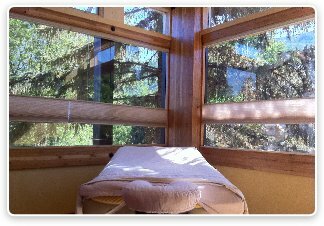 Get the Best Massage in Aspen! Our philosophy is that massage therapy is part of a healthy lifestyle and a great tool to help everyday people and athletes get more out of life. The custom rooms are perfectly designed to offer our clients a relaxing and peaceful oasis in downtown Aspen. Our licensed therapists are adept at providing the amazing physical and psychological benefits that therapeutic bodywork offers. They have been trained by the best from around the world to give you the best massage in Aspen. With Jean-Robert's leadership and experience as an world-class personal trainer, massage therapist and school director of AMI, he has created a facility unlike any other, right here in Aspen. We believe it is such an important ingredient to overall health that we created the Aspen Massage Institute (AMI) to ensure that we always have the best trained therapists on staff! AMI exceeds Colorado’s requirements, is approved and regulated by the Division of Private Occupational School Board, and is members of both the AMTA (American Massage Therapy Association) and ARMP (Associated Bodywork and Massage Professionals). Our students are trained in both eastern and western techniques, the human body, as well as top customer service so that they can provide a first class experience for our clients. All of our licensed therapists have easily passed state and national certifications and have already helped many people find peace, relief and relaxation. We are confindent that you will have the most relaxing and wonderful experience from our team. We believe everyone deserves a massage and have several levels for you to choose from, starting with our instructor therapists, newly-certified therapists and students (weekends only). Imagine one of the most peaceful places on earth nestled in downtown Aspen. Envision yourself being pampered by a certified massage therapist as the stress, fatigue and sore muscles melt away. Visualize lying comfortably, relaxing and enjoying the best Aspen has to offer. This is not a dream. Welcome to Jean-Robert’s Massage Therapy. Our therapists are highly skilled, professionally trained and licensed in the state of Colorado. We carefully choose the best so you can experience all the wonderful benefits of massage therapy while knowing you are in safe and well trained hands. Whether you want to unwind after a fantastic day on the slopes, have muscles soothed after a beautiful hike into the mountains, or just want to relax and be treated like royalty, our team will make you feel wonderful. Massage therapy is no longer limited to expensive spas, resorts or faraway places. In fact, companies, health professionals, hospitals and even airports are welcoming the therapeutic touch of certified therapists. The growing understanding of the benefits are ushering in new era of natural health and increasing awareness around this centuries old technique. Massage is no longer considered just a way to help aching muscles, although it does do wonders, it has become a fantastic therapeutic tool for everything from stress reduction to treating and relieving chronic pain. There are many different forms of massage and whatever technique you choose, you can be assured our massage therapists will pamper you, offer you a reviving body treatment after a day’s skiing or hiking, and bring a sense of calmness to your body and soul. Studies continue to prove what we’ve always known, massage therapy reduces stress and anxiety. In addition, it helps your body release endorphins, our natural pain relievers, bringing natural promoting natural healing. Not only does having massages on a regular basis help lift your mood, it suppresses anxiety and leads to a more peaceful and positive outlook. Relaxed muscles always make falling asleep easier and more restful. Massage therapy treatments also bring you peace of mind, alleviating the stresses of the day and helping you drift off with fewer worries. Whether you are staying in a great Aspen bed and breakfast or going home after a long day in the office, you will find your bed more comfortable. After a day of hiking, skiing or even shopping, massage therapy has amazing health benefits. Our therapists are trained in techniques that increase blood circulation, ease sore muscles, increase flexibility, ease aches and pains, and get you back into the day ready to go. It feels fantastic. There is nothing better than being pampered and having your pains gently massaged away. Treat yourself like royalty and enjoy every minute of it!